Affectionately known as Honey Monster, Chunky Monkey or Snoring Dog – the latter mainly due to the fact 95% of her time is spent sleeping. She is an old lady these days, a 10 year old Cavalier King Charles with a heart murmur and arthritis that does not stop her getting excited when she sees people. Having always loved a fuss, as any lap dog does, the one thing she has never really enjoyed is having her teeth cleaned… that’s right… dental hygiene is just as important for dogs as their overall health and even a super cute toothbrush never helped. This is where Pedigree Dentastix step in and save the day! Honey has always been a fan of Dentastix and as have I. Pedigree have produced pet food and treats for over 80 years now… they know exactly what they are doing and I have every faith in them to offer the best to complement Honey’s health, happiness and general wellbeing. So to take part in the Pedigree Dentastix campaign has been a lovely daily treat for Honey – recommended by vets, low in fat and containing no extra sugar an only 82 calories per stick (7 sticks in a bag with the size dependent on the size of your dog – small/medium/large dog), this is a daily treat that I am reassured is helping her. 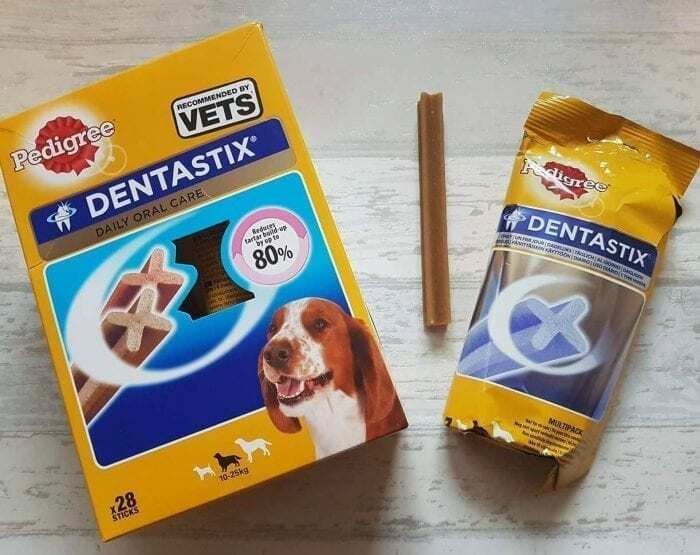 The gentle abrasive texture and active ingredients help to reduce plaque and tartar build up by up to 80% in your dog’s mouth – Dentastix are shaped into a long X shaped stick which helps the treat to those very tricky places to reach! Vets will always check a dog’s gums and teeth on an annual check up – it’s very surprising to read that 4 out of 5 of dogs over the age of 3 years have gum disease. Something that Honey thankfully does not suffer with. As you can see, Honey has quite enjoyed this particular campaign, although did become a little camera shy whilst she was chomping away! Pedigree have a fantastic range of dog dental care products alongside Dentastix that help look after your dog’s gnashers and gums in treat form which are definitely worth checking out! This post is a collaboration with Pedigree, but all thoughts are my own. For additional dental care information you can read the following Pedigree Reviews article for tips and advice. Hahaah 😀 they always love mint!